In the 19th century George Scammell was a wheelwright in Spitalfields, London. His firm became G Scammell and Nephew, building and repairing horse-drawn vehicles, then working on steam wagons. They moved on to building motor trucks, the ‘articulated six-wheeler’ going into production in 1920. In 1926 the world’s first frameless tanker was patented. In 1927 the Pioneer 6×4 off-road truck was launched, and in 1929 the 100-ton heavy haulage Scammell appeared. In 1933 Scammell bought from Napier the patent for a three-wheel tractor, the Mechanical Horse, which sold phenomenally well. The firm had financial problems in the 1930s, however, and Shell-Mex had to inject capital. Rigid Sixes and Eights were popular, and in wartime the Pioneer became a tank transporter tractor. After the war the Showtrac was produced for showmen, and other models included the 6×6 Explorer, 4×4 Mountaineer and the Constructor. The Rolls-Royce-powered Super Constructor topped the range. 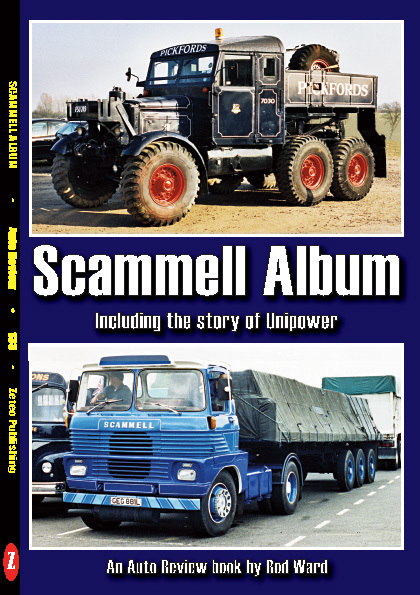 When Scammell was acquired by Leyland in 1955, some smaller Leyland-powered trucks included the normal control two-axle Highwayman, the forward control four-axle Routeman, and the forward control two-axle Handyman. Two-axle Sherpa and three-axle Himalayan dumptrucks were added to the range. In the 1960s Michelotti designed a GRP cab for the Routeman, Handyman, and the twin-steer Trunker. 1964 saw the new Contractor prime-mover, and in 1969 the Crusader was launched. In 1972 British Leyland closed Thornycroft, transferring to Scammell’s Watford plant production of their Bush Tractors and Nubian crash tenders. Updated versions of the Routeman, Handyman and Trunker were followed by the Contractor Mark 2 and the Commander tank transporter. The S24 (the Contractor successor) used the same cab as the Leyland Landtrain, which was also developed by Scammell. The S26 was a four-axle heavy haulage version of the Roadtrain. When DAF took over Leyland in 1987, they closed the Scammell Watford plant.